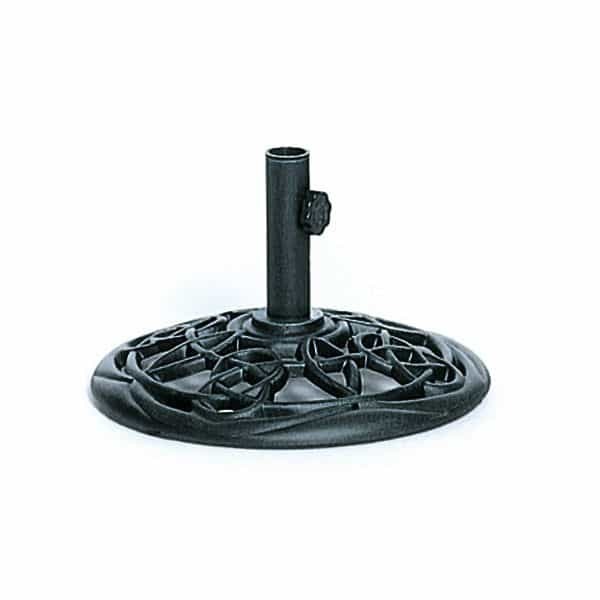 Cast iron umbrella bases are the umbrella bases that are not fooling around. They are made to serve as heavy-duty weights to hold your umbrella firmly and steadily where you want it. The Ventura Umbrella Base doesn’t take up any unnecessary space, and counterbalances an umbrella with 33 pounds of strength. The Ventura Umbrella Base is finished in either Black or Tierra Mist, depending on style desires. The black version adds drama and class, and the terra mist is slightly more light and airy. Both designs feature the Ventura design, which is ornate, twisted and intertwining. Hanamint is a fine designer of outdoor furniture and necessities that make outdoor spaces tick. They understand the perfect marriage between form and function. If you’re tired of hiding your unsightly umbrella holder under tables and chairs, find one that you’ll be proud to parade out, front and center. Perhaps the Ventura Umbrella Base is the one for you!